In May, 1997, after visiting the Oceans of Kansas Paleontology webpage, Steve Johnson contacted me to ask about some unusual vertebrae that he and his family had discovered on a field trip in the chalk in 1996. From his description over the phone, I was pretty sure that they were mosasaur vertebrae. They seemed to be fairly small, so I told him that I would like to see them first to be certain. We made arrangements to get together later in the week, and as I suspected, the hand full of vertebrae came from a fairly small mosasaur. He showed me several light brown cervical and thoracic vertebrae that were nicely preserved without a lot of deformation due to crushing. Steve said they were eroding from the base of a chalk slope and he thought there were still some left. I asked him where the material had been found and recognized the locality from his description. It was immediately interesting since it was in the middle of the Smoky Hill chalk formation where only a few mosasaurs have been documented and fewer still are associated with good stratigraphic data. Then he told me that he was taking the family back to the site on Memorial Day and wondered if we would like to meet them out there. We had an open weekend, and it seemed like a good excuse to go look around in the chalk at a site where we had not been in several years. A view looking south at the site where the mosasaur was found. Although not readily visible in this picture, the arrow indicates where Steve Johnson is working on the remains. The shallow canyon is about 150 yards wide at this point. We arrived at the site about noon on the Sunday before Memorial Day. Steve and his family had stayed in Hays overnight and had already been on site for several hours. After introductions, Steve showed me the spot where the mosasaur had been found. It was eroding out of the tan chalk at the same level as the floor of the canyon. A column of chalk rose steeply 3 to 4 feet above the find, then angled sharply upwards toward the top of the canyon wall. This meant that for every foot that we dug back into the chalk, we would have to remove an ever increasing amount of overburden.....sort of a bad luck spot to find something in. Steve had uncovered some additional vertebrae and ribs, and had been very careful in his excavation. He was about as far back, however, as he could go without a lot more digging. After a quick survey of the site and what he had found, I showed him how to cover and protect his working surface while removing large chunks of the overburden. We opened a larger working area with a heavy pick and then settled down to slowly removing the last few inches of chalk over the bones. Within a few minutes, we had found skull material and I was pretty sure that most of the skull could be excavated without a lot more digging......I was about half right. Looking down at the mosasaur remains in the chalk matrix. The large bone at the left is the back of the right lower jaw. One quadrate is visible immediately to the left of this bone and the other is located in the lower center of the picture. At the top of the photo, just inside the shadow is one of the maxillaries (upper jaws) with several teeth visible. The triangular shaped frontal is laying on top of the left end of this bone. Two nearly complete ribs are evident in the lower center of the picture. By the end of the day, we had found a large portion of the skull including the frontal, parietal, both quadrates, and several pieces of the upper and lower jaws with lots of big, and mostly complete teeth. Problem was, we did not have the complete skull yet and it looked like someone was going to have to come back at a later date and move a lot more rock. It was pretty easy for me to figure who that person was going to be......since Steve had found the beast, he got the honor of digging it out (Sort of like the old fishing adage; "You caught them, you clean them!"). The interesting part came when we tried to identify the species of the mosasaur that Steve had found. In the field, the remains initially looked like they could be from an adult Clidastes, but after further examination, we decided that it was probably a juvenile Platecarpus (?) instead. Although the specimen shared a number of diagnostic characters with the Platecarpus ictericus pictured elsewhere on this website, there are several significant differences in the relative proportions of different elements of the skull. We could not decide on which species of Platecarpus (P. ictericus, P. planifrons, or ???) at that point, however, and decided that we needed to get some help. All told, Steve spent several more days at the site, pounding rocks in the hot sun, getting blisters, and recovering what appeared to be most of the skull and 25 vertebrae from the mosasaur. Unfortunately, there was no limb material recovered with the specimen. Even though the specimen appeared to go further into the chalk, Steve eventually reached the point of diminishing returns as the chalk overburden loomed higher and higher over the level of the bones. Whatever bones remain are safely contained in the chalk and we will look back at the site periodically to see if anything else erodes out. Steve spent quite a few hours doing the preliminary cleaning of the bones and preserving some of the more fragile material. Then he entrusted his specimen to me so that I could do the final cleaning with a micro-blaster. The bones cleaned up very nicely and it turned out that the skull was nearly complete and in excellent condition. 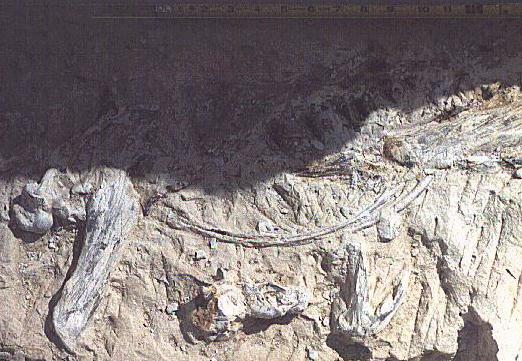 From the way that the skull was disarticulated and the small oysters that had colonized some of the bones, it appeared that the remains of the mosasaur had been exposed for some time on the sea bottom before being covered with sediment. As of the middle of December, 1997, the species was STILL uncertain. At that point, we were fairly certain that the specimen was not a described member of the genus Platecarpus, but there was a lot of work to be done before a decision could be reached on what it was. At any rate, it was still a tremendous find! Good work, Steve!!!! In January, 1998, Steve and I went back to the site to determine the stratigraphy of the area. 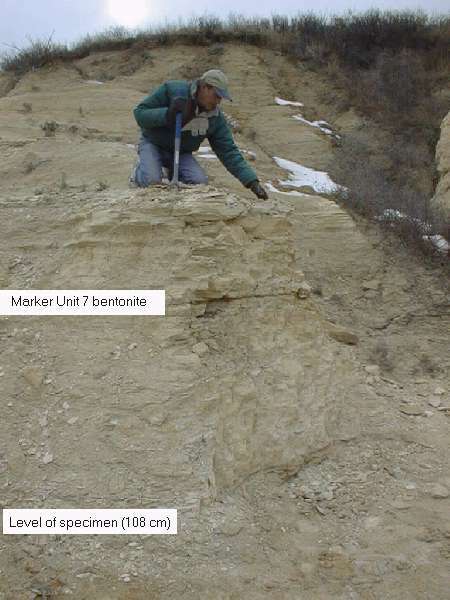 As shown in the picture (LEFT), the little mosasaur came from a layer about 108 cm below a gray bentonite called Marker Unit 7. Steve is holding an all metal pick that he eventually broke! And, yes, the white stuff is the remains of an early snow (actually a blizzard!). EPILOG: In early 1998, the skull and vertebrae were sent to Dr. David Schwimmer at Columbus State University, Columbus, Georgia on a loan to Caitlin Kiernan for further preparation and examination. Caitlin, a paleontologist who specializes in mosasaurs, had seen the pictures posted on the Internet and believed that the specimen might be something new and undescribed. She was cautiously optimistic but wanted to compare the material with other specimens. During the Spring of 1998, she completed the preparation that Steve Johnson and I had begun in the Summer of 1997. She determined that most of the skull had been recovered. In June, she visited the American Museum of Natural History and examined the type specimen of Platecarpus planifrons, first described and named by E. D. Cope in 1872. Her verdict was disappointing but well founded. Steve Johnson's little mosasaur most likely was Platecarpus planifrons, smaller, better preserved and much more complete than the type specimen, but still the same species. Steve and I would like to acknowledge the work of Caitlin R. Kiernan and express our appreciation for the hours of her time spent in the meticulous preparation of this specimen. EPILOG 2: Almost three years later, Steve and I talked to Mike Triebold of Triebold Paleontology about creating a 3-D skull from the bones of Steve's Platecarpus NOT planifrons. Steve was about to donate the specimen to the Sternberg Museum and wanted to have a cast made so that he would have something to keep. Mike was agreeable and the bones were shipped off to be further prepared, repaired and cast. In late September, 2001, the process was complete and the assembled skull was returned along with the original specimen. Meanwhile, Steve and I had submitted an abstract to the Society of Vertebrate Paleontology for the 2001 meeting in Bozeman, Montana, and it was accepted into the Poster Session. So, in early October, I loaded up a model of the skull, and the poster materials and headed off for the SVP annual meeting. A overall view of the poster is shown HERE, along with detailed images and the abstract of the presentation. The skull was donated to the Sternberg Museum in November 2001 by Steve Johnson and was curated under catalog number FHSM VP-13910. SVP ABSTRACT (2001): THIS ABSTRACT NEEDS SIGNIFICANT REVISION BUT UNFORTUNATELY HAS ALREADY BEEN PUBLISHED. Two recently collected specimens of Platecarpus planifrons extend the range of this uncommon mosasaur upward to the early Santonian level of the Smoky Hill Chalk Member (second quarter of the member, below Marker Unit 7, biostratigraphic zone of Cladoceramus undulatoplicatus) of the Niobrara Chalk. Early records of the species (more than a dozen specimens, including the type, collected by the Cope, Marsh, and Williston parties), although imprecise about locality and stratigraphy, appear to have been collected primarily from Trego County, Kansas, and mostly from lower chalk exposures along Hackberry Creek. These localities would place the species in the late Coniacian level of the Smoky Hill Chalk Member (lowermost quarter of the chalk, below Marker Unit 5, biostratigraphic zone of Protosphyraena perniciosa). PHOTO GALLERIES: The following pages include a number of pictures of the original skull material from Steve Johnsons Selmasaurus johnsoni, and the reconstruction.